Although it was not Tamar’s fault, it would seem that she could be blamed by her accusers for going to his sick bed. I’m sure there will be rumors or suggestions in the air. Is that what her father King David thought? Is that why he never addressed this heinous crime? Why won’t she speak up? How could anyone have known Tamar was targeted? A victim of a well thought out scheme to satisfy her brothers selfish indulgence. Ironically, Amnon hated Tamar, but he didn’t hate his own sin. He threw her out like a piece of trash. Imagine this irony. Here she is the daughter of the king, lifeless in the king’s house. After the crime, her royal robe was still in tact. She was no less the daughter of the king than she was before the deed was done. But she no longer felt worthy to wear the royal robes—so she tore them. She would never be able to use her privileges again. She choose to strip herself of her royalty identity. Now, shame became the garment that she wore. She choose not to summon her father, the king, to get justice. After all, if she was valued, wouldn’t her father want to automatically want to stand up for her? She choose to detach herself from whom she was born to be. She choose to mark her own head with ashes. The same ashes that were the result of making her sick brother a loaf of her special bread. But her silence protected him, hence her trust issues began. 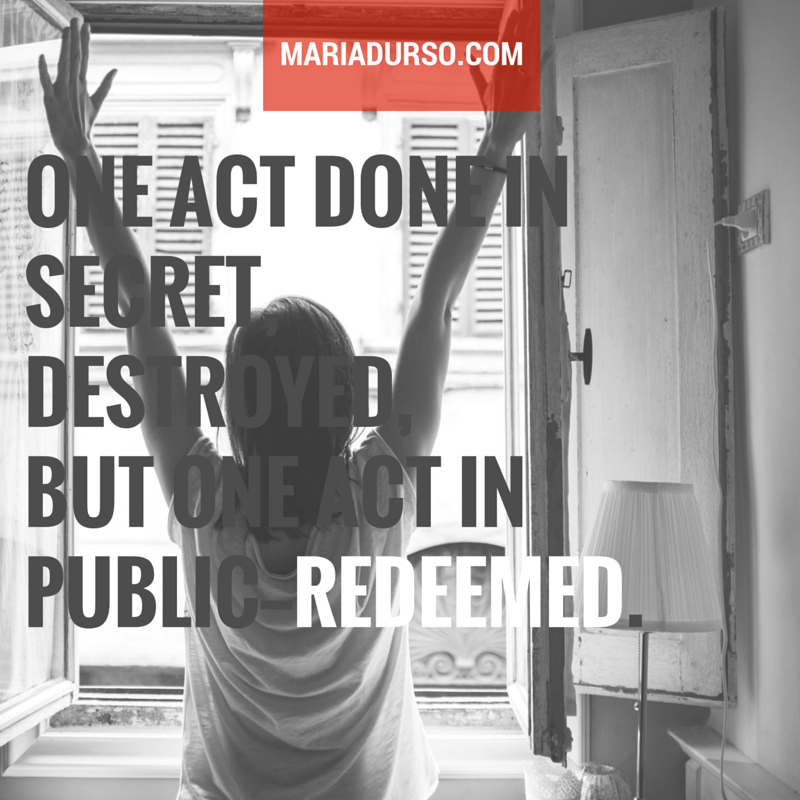 One act done in secret, destroyed, but one act in public—redeemed. One king became an instrument, aiding in his daughter’s wrong. One king became an instrument to right all wrongs. One king chose to keep on his royal robes and not confront the issue. One king chose to have his royal robe stripped from him confronting the issue of all sin and injustice head on—in order to cover our shame with robes of royalty. That king—King Jesus—gave us back our identity as daughters of the king so we will be no longer desolate. So that we can speak up! (Copyright © 2015 by Maria Durso, All Rights Reserved. Purchase a copy of my book, From Your Head to Your Heart, on Amazon here). « Did I bring this on myself? Jesus has restored me so, that i refuse to stay quiet. I talk about my Jesus every chance i get. Because He definitely redeems & restores!! !